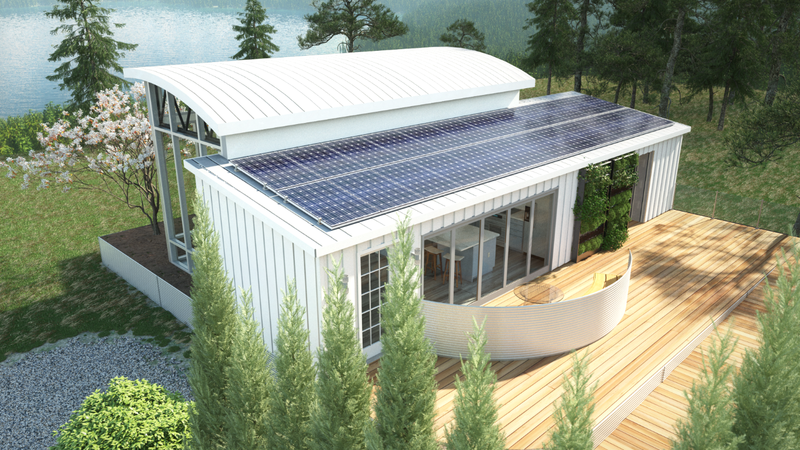 For the U.S. Department of Energy Solar Decathlon 2017, Missouri S&T has developed SILO. SILO is more than just a self-sustaining, net-zero home. Each letter in the acronym represents a core aspect of the house. The “S” in SILO is for smart, found by a home automation system that allows the homeowner to live efficiently and at ease. The “I” stands for innovative; cutting-edge and sustainable technologies found throughout the house, including a solar array, greywater reclamation, and energy storage. The “L” in SILO is Living. The home’s abundant greenery and modern and efficient appliances combine for truly smart living. Additionally, ample sunlight, clean air, and relaxing atmosphere create the “O” in SILO, which stands for oasis. Together combining into a relaxing forever home for a couple to experience a Smart Innovative Living Oasis. SILO’s home automation creates a system of devices that work in tandem to create a more energy efficient home, while removing the need to worry about how one device interacts with another. A combination of physical and wireless networks track, automate, and maintain the HVAC system, lighting modules, window motors, fan headers, and batteries. With the intended system in place, the homeowner does not need to worry about dimming the lighting fixtures, adjusting the HVAC system, or worrying about how much energy the house needs. This is because the automation system makes calculations that would allow the connected systems to efficiently manage their own resources, making sure that the homeowner does not use more energy than necessary. The house also allows the homeowner to manually control the systems, providing control and personalized adjustments. Additionally, SILO has an energy monitoring system that sends feedback to the central control system in order to manage the power stored in the house’s battery, be it by selling energy to the grid or using the energy in the house. To assist with ease-of-access, the resident will be able to use voice commands to adjust the house’s systems to their preference. Together, these systems will work to create a comfortable and efficient living space for the homeowner. The Team is incorporating a greywater and rainwater collection system. The greywater system is a further researched and implemented system from the 2015 Nest Home’s greywater system. The rainwater is routed to the plants and landscaping with the possibility of a reverse osmosis system to create clean drinking water. SILO includes an innovative shower system that uses less water by increasing the number of droplets but reducing the droplets’ size. This creates larger surface to volume ratio, saving water without changing the shower experience. A variable speed heat pump and radiant flooring alongside an ERV will cool and heat the house efficiently and effectively. An energy recovery ventilator (ERV) is included and has the capability to bring in fresh outdoor air while minimizing the unwanted loss or gain of heat and moisture. This system benefits the air by drawing out moisture and particulates using a compatible ventilation design.